Flexitank (Australia) launches a new range of flexible fuel bladders/cells to hold a wide range of liquids and fuels. Developed with versatility in mind the new range from Flexitank (Australia) will hold from 250 litres – 1500 litres and are available in single layer and dual layer varieties. The fuel bladders are made from Flexitank’s exclusive heavy-duty fabric that is primarily used in fuel bladders manufactured for USA military purposes. Both the single layer and dual layer range are also internally baffled to meet EPA requirements with the dual layer range meeting all worldwide EPA requirements for self bunded or dual layer fuel tanks using in tank technology. To save space when the fuel tanks are not in use the single layer tank folds down to 1/10th of its filled size, and the dual layer tank folds down to 1/7th of its filled size, making them amazingly space efficient. To complete the design four heavy-duty tie down dee rings are welded to each tank ensuring the tank can be secured once it’s full, no matter what the liquid inside is. 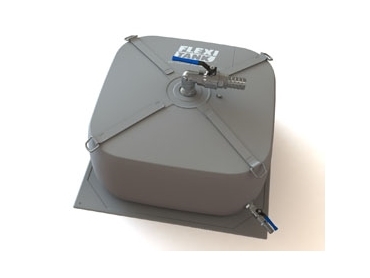 “We have designed this range of flexible bladder tanks to suit almost any fuel application we have ever been asked about,” explained Gavin Hodgins, Flexitank’s Operations Manager. And this is no understatement as Flexitank’s flexible fuel bladders/cells have been tested to hold a huge range of fuels and liquids including: Diesel fuel, Bio-Diesel fuel, Petrol/gasoline, E-10 Bio-Ethanol, Jet Fuel, Kerosene, AVGAS, #2 & #4 fuel oils, Lubricants, AdBlue (Diesel Exhaust Fluid). Individually pressure tested to 3psi after manufacture is complete, each fuel tank is supplied with 316 grade stainless steel fittings plus attachments, pressure valve, and a ground sheet manufactured from the same tank fabric, all as standard. No matter the fuel or liquid to carry, Flexitank has fuel holding and transporting needs covered. The tanks are available for immediate purchase from Flexitank’s online store and are now in stock.